In action a week after he sent this to his parents. Ronald kept this poem on his bedroom wall. The warriors that much older grew. Ones who stood tall when life depends. Heroes, perhaps, of bygone year. Is reason not for tears at all. May your flight be smooth, may the flak be light. 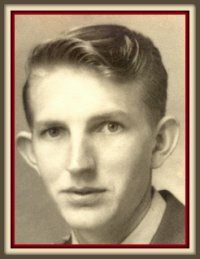 Bereman, Ronald E., “Ron”, 83, of Largo, died Thursday, January 9th, 2003 at his home. He was born in Indianapolis, IN and came here in 2001 from Fort Myers. Locally, he was a member of First United Methodist Church in Largo. He was a WW II Air Force veteran where he retired as a Major. He was a pilot and flew 30 missions over Germany, two of those as the lead pilot. He was the recipient of the distinguished flying cross medal and the Air Force medal with oak leaf clusters. He was a member of the 486th Bomber Group whose remaining five members still hold annual reunions, and the 43D Pilot Group. After retiring from the Air Force, he was an Air Traffic Controller for more than 30 years, retiring as Tower Chief at the Hilo, Hawaii airport. He is survived by his wife of 59 years, Frances; 3 sons, Ronald E., II of Boynton Beach, FL; Ernest L. of Ponca City, OK; Richard L. of Huffman, TX; 2 daughters, Shelley L. Bereman-Benevides of Hilo, HI; Pamela L. Norris of Kenneth City; 1 sister, Lenos Perry of Cloverdale, IN; 19 grandchildren and 9 great grandchildren. Anderson-McQueen Funeral Homes & Cremation Tribute Center-Largo Chapel. God's garden must be beautiful-He always takes the best. He saw the roads were getting rough and the hills too hard to climb. So He closed your weary eyelids and whispered "Peace be thine." It broke my heart to lose you, but you did not go alone. For part of me went with you, the day God called you home. For those of you who would like to express your sympathy or leave a treaured "Ronald" story, please sign the guestbook by clicking on the link below. This site designed and maintained by UP ALL NIGHT Web Page Design.